When Matt Robinson and Lena Kim decided to name their West Queen West store Delphic 10 years ago, they didn't realize serendipity's hand at play. They later found out that Delphi is the site in Greece where god Apollo's oracle was located. "Leaders of the community would go there for help, insight - like what we're doing in the fashion world", says Robinson. Delphic could be considered an 'oracle' of streetwear for Torontonian men and women. The store has always been ahead of its time and Robinson and Kim have never stocked the store with any brands other than those that interest them: forward brands with integrity. This method has worked well so far, attracting a medley of clients ranging from teens to people in their 60's and 70's. Robinson clarifies this phenomenon for me in explaining that what they share in common is "a level of sophistication - not in a stuffy way. They want something different". And brands definitely benefit from Robinson and Kim's loyalty. Delphic has been stocking brands like Acne and J.Lindberg for years, long before they were as widespread as they are today. They also stock lesser-known brands, a number of which are not widely available elsewhere. What I think is most wonderful about Delphic is the fact that the brands (and items within brands) stocked in the store are chosen with a "piece" mentality. I have long stocked my closet with "pieces", items that are unique or of-the-moment in some way but still have the power to withstand the test of time (something that is often hard to achieve in the ever-evolving world of fashion). Robinson explains, "We want our customers to fall in love with the items they buy". Since items in the store can be pricey, the fact that they have this potential for longevity beyond trends means you can treat them as wardrobe "investments". Just as Robinson and Kim have always had their finger on the pulse in terms of clothing, the decor of the store was also ahead of it's time. The couple wanted the store to have a 60's feel, with 60's concrete breeze block, wall detail, and even sold mid-century furniture for some time. What they achieved 10 years ago was a relaxed version of the boutique-y look that is so popular today. 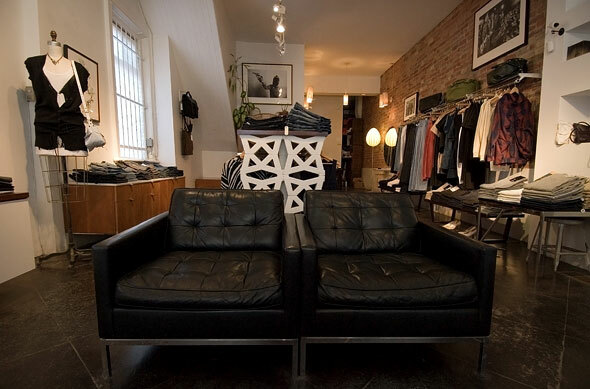 Delphic is a store to check out when you're strolling down West Queen West or a destination if you are in search of unique pieces that don't have expiration dates. The cool decor and local art on the walls sweeten the deal.